The Converse Blog: The Converse Blog: Converse, When you're out to beat the world. The Converse Blog: Converse, When you're out to beat the world. As you can probably imagine over the 100 years of Converse there have been a countless numbers of Commercials, Print Ads, Posters, and other advertising tools. 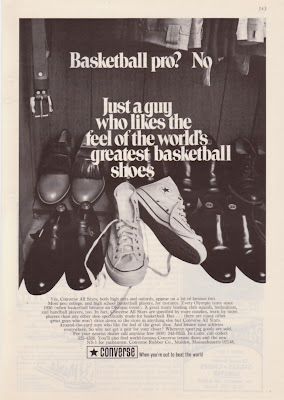 I've decided that I am going to feature some of these ads here at the Converse Blog. Today's ad is full of foreshadowing for the future of the Converse All Star. It reads, "Basketball Pro? No. 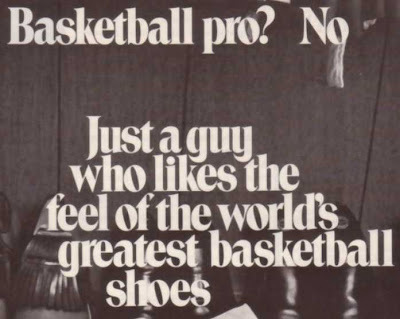 Just a guy who likes the feel of the worlds greatest basketball shoe." That's pretty much where we are for the All Star, the last NBA player to wear a Canvas Converse shoe was Tree Rollins in 1980. This ad came out way before 1980, though I am not sure when. It probably was not in the 70's because there is no Eltra logo anywhere. Which more than likely puts this ad in the 60's. Below are some close ups, but I couldn't get the last one any bigger, so I typed out what is says and I'll post it below. Converse. When you’re out to beat the world. Over the years the All Stars have become the everyday shoe, for everyone, anywhere. Whoever made this ad could see the future and tried to promote them as a shoe that everyone needs. Well that's just a taste of some of the ads that I am going to bring to you in the near future. Thanks for checking out the blog and remember to vote on the poll on the way out.